Now enjoy excellent sound quality and increased power handling without draining your wallet. Massive High Performance Audio is proud to present its V Series Co-Axial speakers that combine graceful dynamics with true value for today�s industry demands. We know you can buy an inexpensive pair of speakers anywhere these days. What the V Series Speakers provide is some of the best quality available in a mid range speaker system for your buck. The V Series Speakers will be hard to match in quality verses price� But we will let you put that to the test! 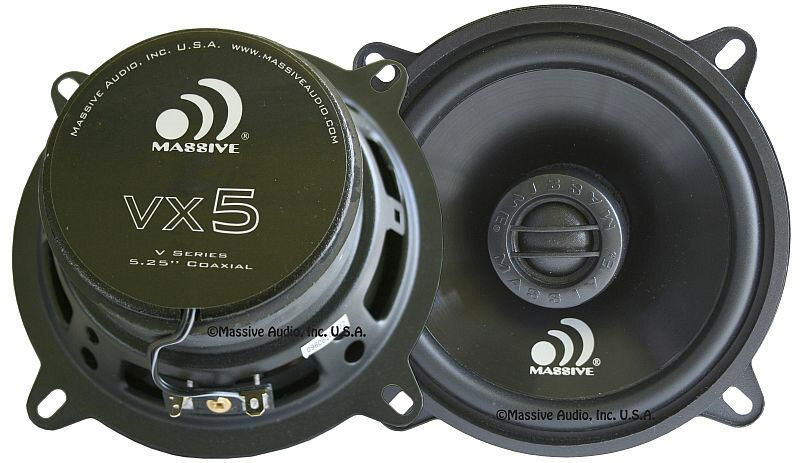 The VX Series has four NEW coaxial speakers designed to be easily installed in most modern autos. All models can handle 50-300 Watts and use 20mm silk soft dome tweeters, heavy gauge steel / low resonance composite baskets, high flux Y35 strontium magnets, pure copper voice coils, fully isolated tinsel leads to eliminate unwanted crosstalk, UV protected poly injected cones with butyl rubber surrounds and custom two piece paint-able grills.